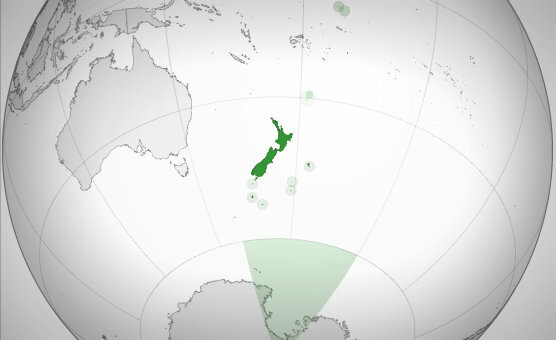 Listening across the globe: 2015 BBC Antarctic Midwinter Broadcast! On Sunday, 21 June 2015, the BBC World Service officially transmitted the 2015 BBC Antarctic Midwinter Broadcast–an international radio broadcast intended for a small group of scientists, technicians, and support staff who work for the British Antarctic Survey. This is one of my favorite annual broadcasts, and I endeavor to listen every year. This year, the SWLing Post called upon readers to make a short recording of the broadcast from their locale. We received a total of thirty (!) recordings, from every continent (save Antarctica, that is; I’m sure the BAS team were too busy celebrating)…Wow! Thank you, participants! Notes: The BBC World Service Antarctic Midwinter Broadcast. Woofferton transmitter. Receiver: Tecsun PL-660 + 15m wire antenna. 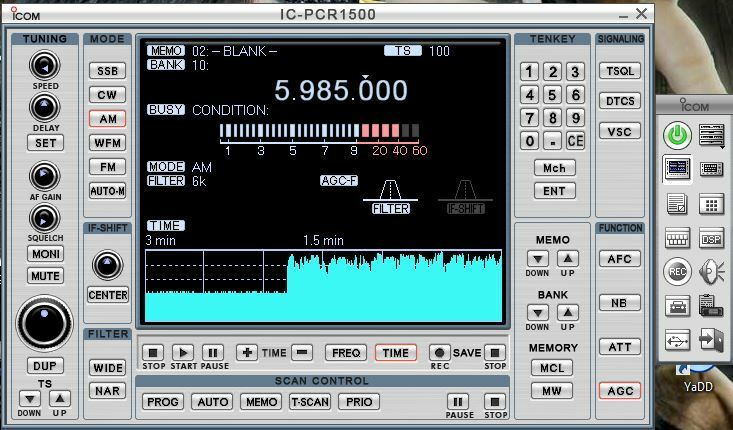 Notes: Babul listened to the broadcast with his ICOM IC-R75 receiver, connected to a 176 meter long beverage antenna oriented in a West South direction. Notes: Here is a sound file of the broadcast monitored in central Malaysia, using the frequency 5.985 kHz via Ascension Island at 21.30 UTC. By 21.35 UTC, QRM from presumably Myanmar Radio overwhelmed this frequency. Worst of all, reception on 9.590 kHz via Wooffeton was in audible due to strong QRM from PBS Xizang. Transmission on 5.905 via Dhabbaya was the only audible signal after 21.35 UTC, and it was a paltry (SINPO) 15341, best heard in USB. 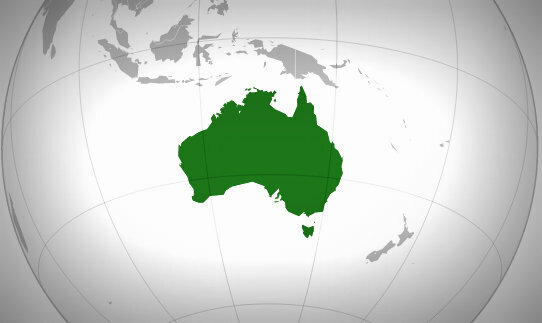 Notes: All three freqs noted here at Mount Evelyn, southeastern Australia: 5905.1 – Off freq and with a slight hum but a good signal, 5985 – Best of the three freqs, strong and clear, 9590 – Good signal but with moderate QRM from PBS Xizang co-channel. Pity! I suspect that freq would not have been as good down south either. Overall, a reasonable success this year. Notes: Attached my recording of the BBC Antarctic Midwinter broadcast on 5985 kHz. last Sunday June 21st. Something about my listening conditions: I have been listening with a JRC NRD-535DG to which a 13,5 longwire has been connected, hanging outside on the (large) uncovered balcony of my apartment, 3rd (top) floor. 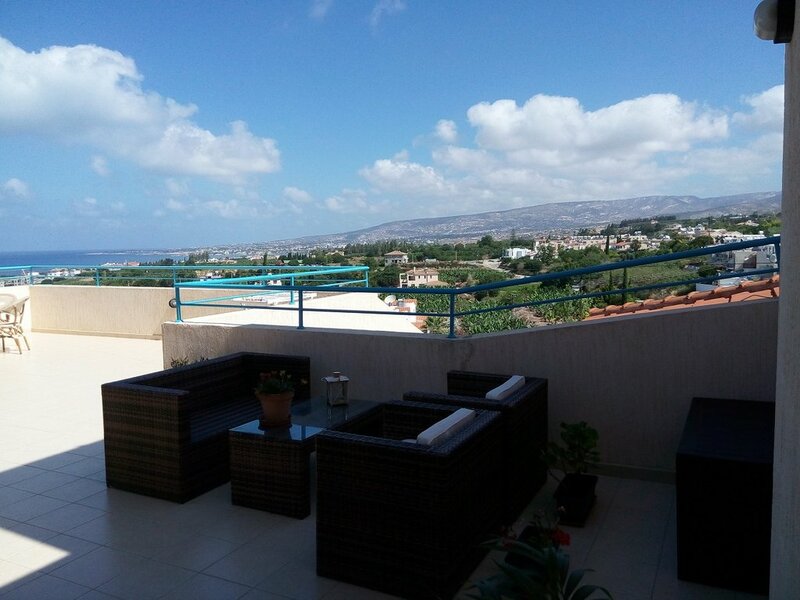 I live about 500m from the coastline of the western part of Cyprus, about 8 km. north of the city of Paphos in a village called Kissonerga. Generally reception conditions are very good here, so close to the sea with no high buildings around. 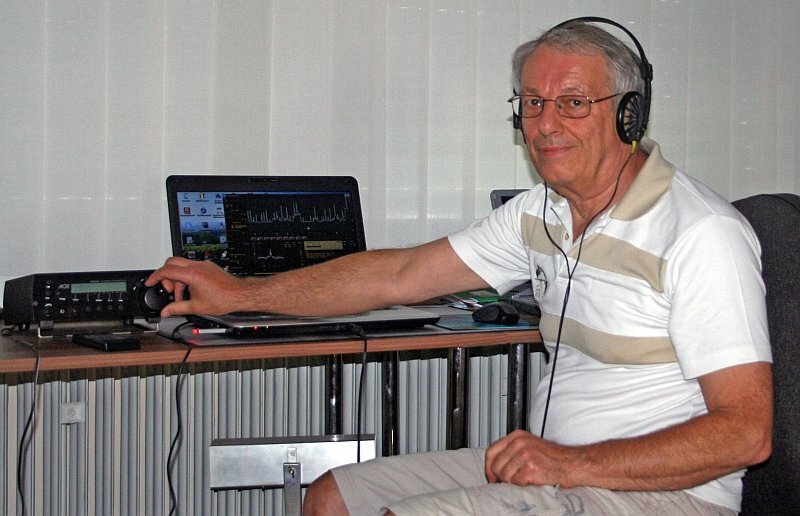 Notes: Willy used an Icom IC-756 Pro with an inverted V antenna. He noted that 9590 kHz and 5985 kHz were equal in signal strength and quality. Notes: Here is my recording of the last 1,5 minutes of the Antarctic Midwinter Broadcast 2015 on 5985 kHz. My receiving-setup: Tecsun PL-880 with telescope antenna (indoor near a window on the 4th floor), line out to Macbook (audacity-software) Unfortunately I got lots of RFI from my neighbour’s powerline adapter so the signal from Wooferton was strong but not noise-free. 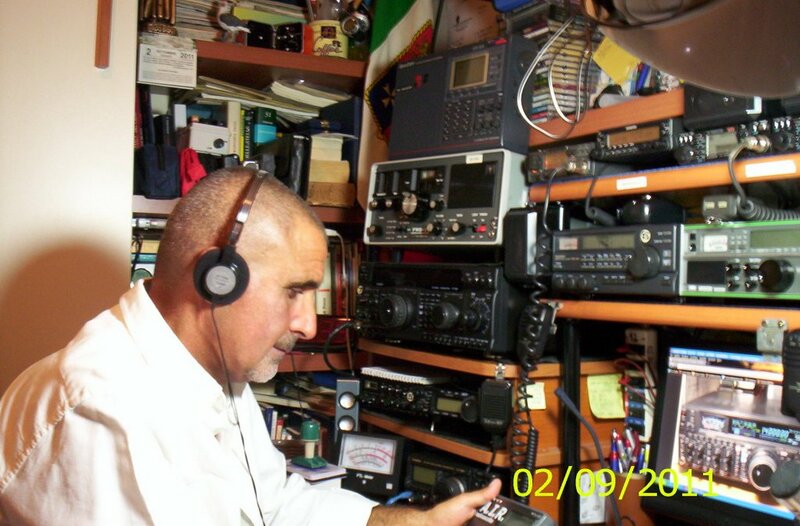 Notes: recorded the broadcast on his Icom IC-PRC1500 with an antenna at 10 meters high. 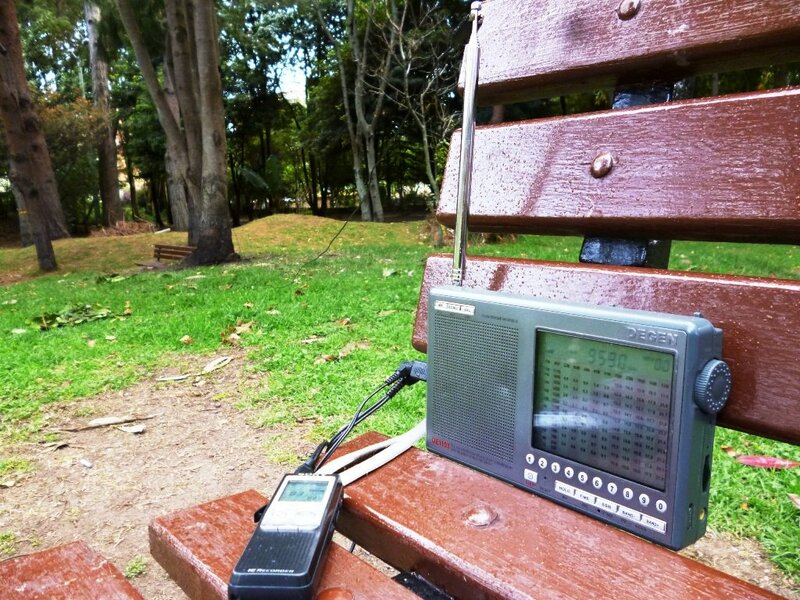 Notes: I heard the BBC broadcast with my AOR AR 3030 receiver and Mini Whip antenna, and Tecsun PL-660. 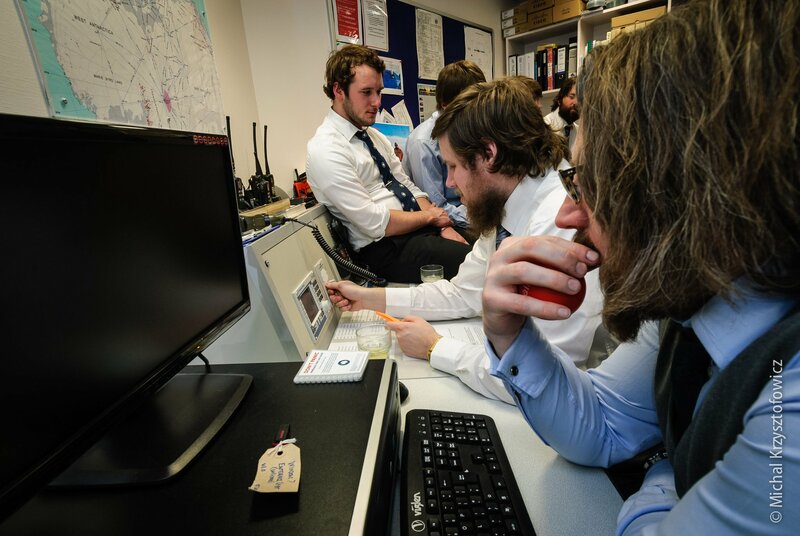 Notes: Here’s a clip from the University Twente SDR reception from Woofterton 5985 from 2145 onwards. 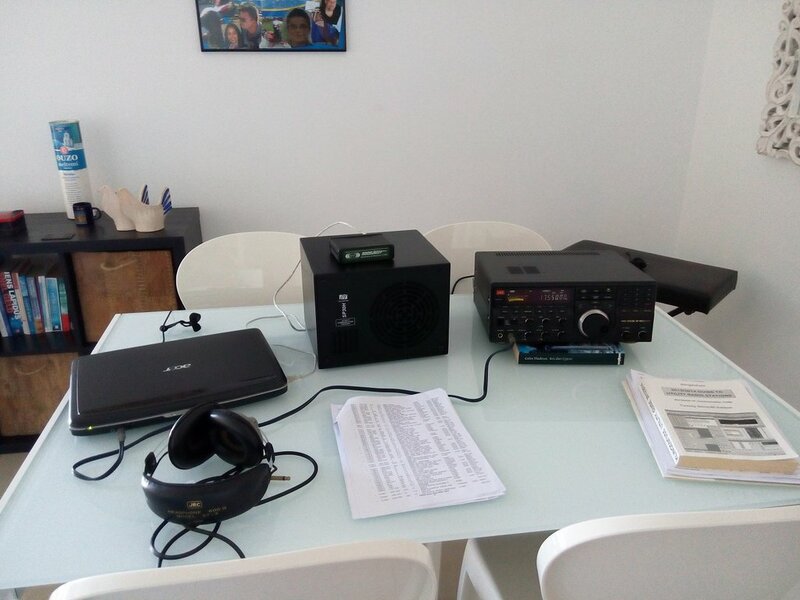 Notes: [H]ere is my reception in Portugal (Porto, northern of Portugal), using a Tecsun PL-310ET with just the telescopic antenna on my kitchen window, very strong signal. 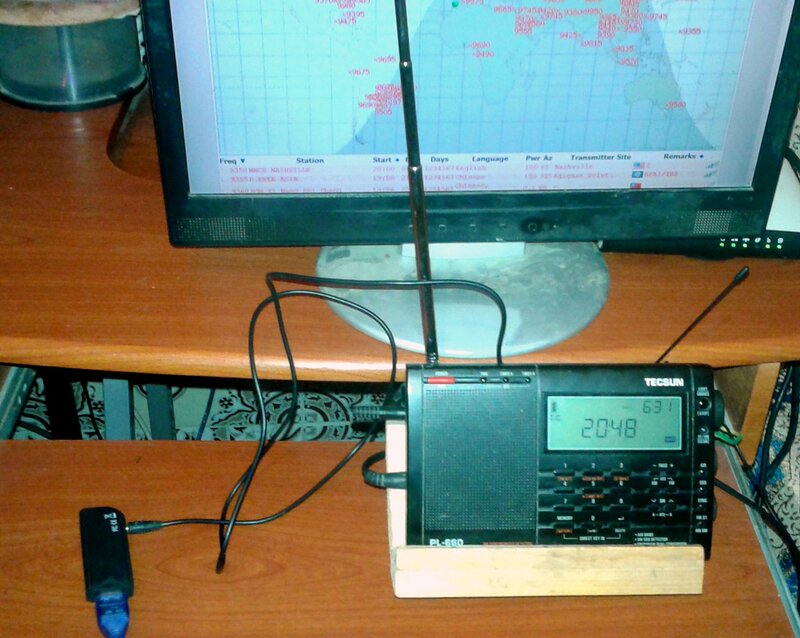 Notes: Receiver setup: Eton E1XM, 60m wire antenna. Notes: BBC Antarctic Midwinter Broadcast 2015 – for SWLing.com. Moscow. Grundig Satellit 1400 built-in mini whip. Notes: Please find 2 recordings from your special Midwinter broadcast: 5905 kHz (S9+10, rapid fading, quite noisy) and 5985 kHz ( S9+40, fantastic signal). 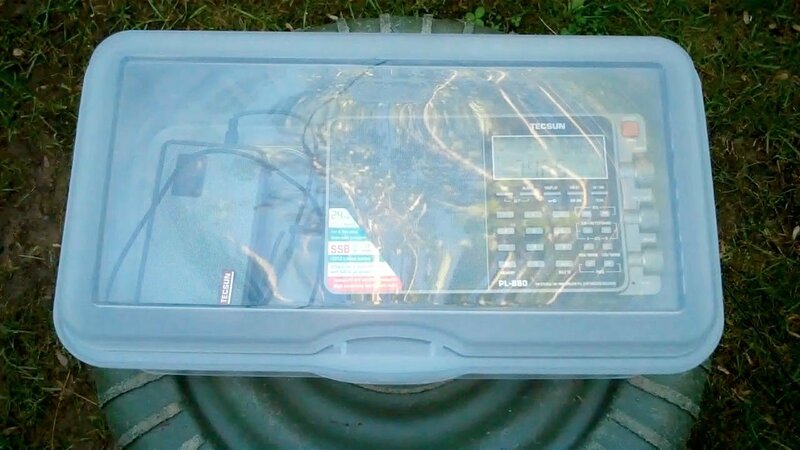 Receiver used was a PERSEUS SDR and a 5×10 meters active loop antenna. Keep up the good work and 73 also to all in the Antarctica! Notes: I am located in Istanbul, Turkey. I used Sony ICF-SW77 for listening with internal antenna on 5905 KHz. The sound was not clear but understandable. 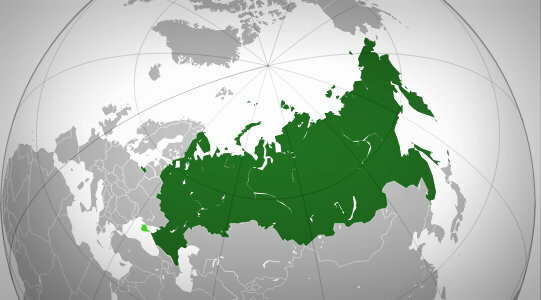 Time was 21:35 UTC. Notes: 9,590Khz on the Elad FDM-S2 with a 15m random wire. Notes: The recording was made using a camera in AVI format, which has been converted to MP3. The time stamp on the video is 17:46 EST. The recording is from a Grundig Yacht Boy 400. The best reception was by laying the Grundig flat with the radio antenna facing North East. No longwire or external aerial was used. 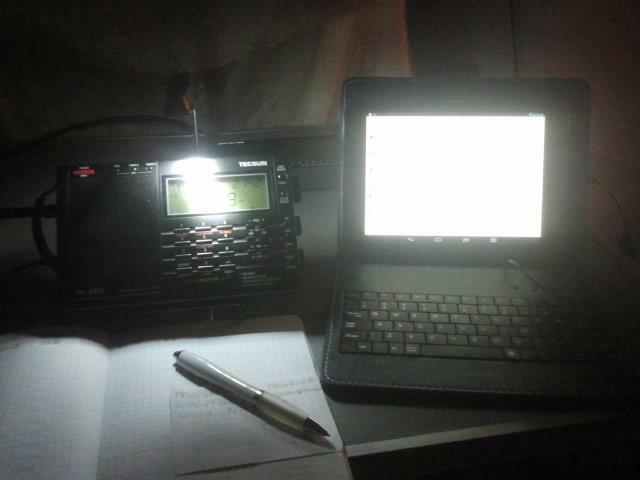 I was also able to receive the signal on my Tecsun PL-380, but the signal was very muffled with excessive static. Richard’s Tecsun PL-880 and Tecsun digital recorder in a protective plastic case outdoors. Notes: Richard listened to the broadcast on 9,590 kHz. 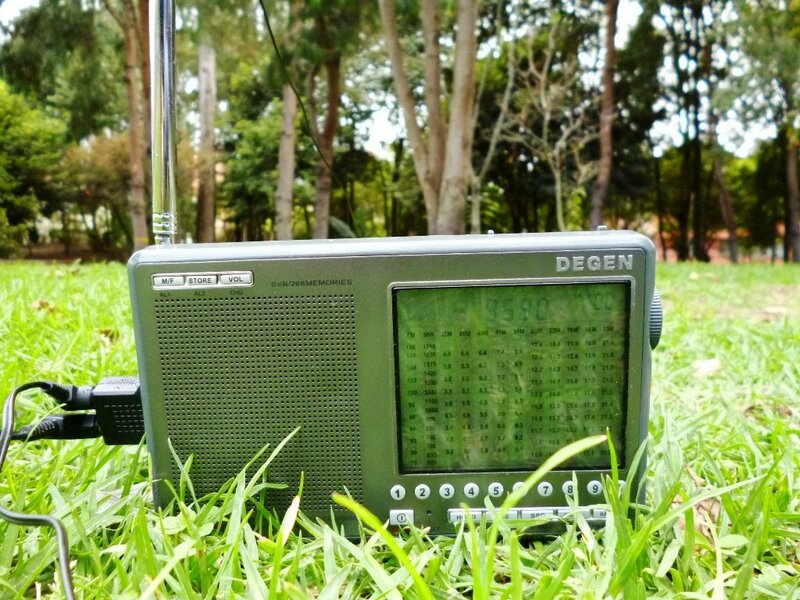 He notes that it was received on a Tecsun PL-880 receiver with a Tecsun AN-03L 7-metre wire antenna in AM mode with 3.5 kHz RF filtering. 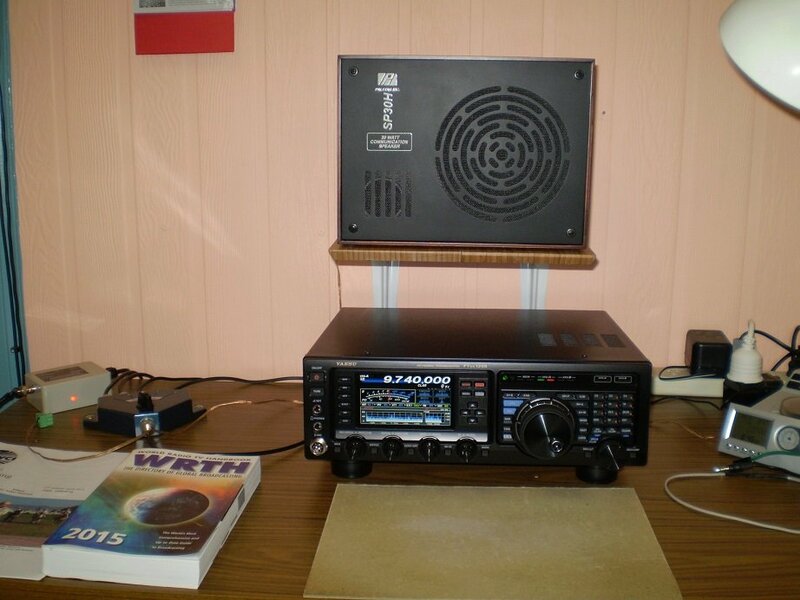 Notes: using a JRC NRD-515 receiver, with Wellbrook 1530 loop antenna. 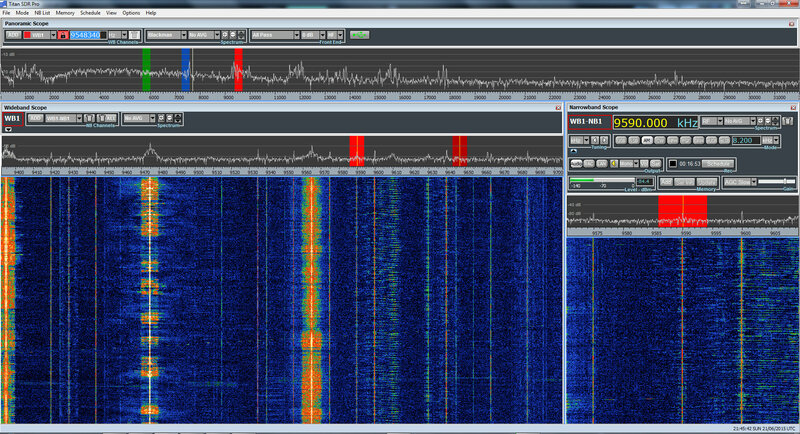 A screen capture of the TitanSDR Pro as I recorded all three frequencies of the BBC Midwinter broadcast simultaneously. 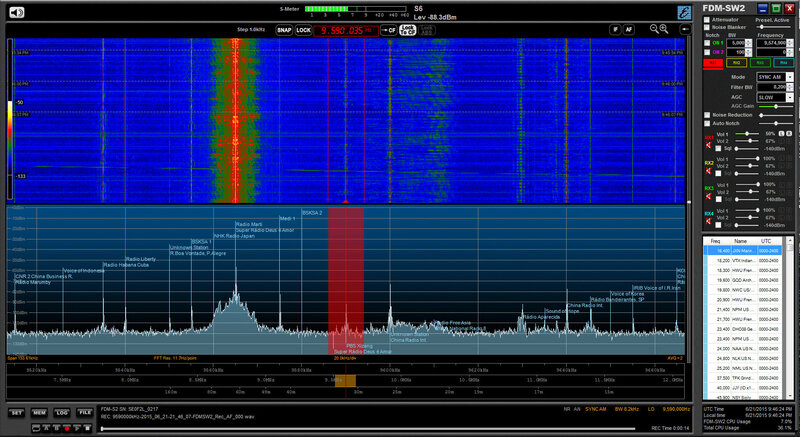 Notes: I recorded the broadcast on a total of three SDRs simultaneously: the TitanSDR Pro, Elad-FDM-S2 and the WinRadio Excalibur. I was very pleased to hear the broadcast on 9590 kHz. Since North Carolina was not in the path of this broadcast, it was a weak signal. All three receivers were using the same large outdoor horizontal delta loop at 60′ above the ground. The following embedded audio player, should contain all three recordings. Note that the FDM-S2 recording (which is perhaps the best of the three) starts in the middle of the broadcast. Notes: Greetings from Colombia. I could only hear the signal at 9590 KHz. The location is [at] a park close to my house (aprox. Lat 4 72 62 N Long 74 02 85 W; alt 2577 m over level sea). I use a Degen DE1103 with Sony AN61 Antenna, to record a Sony ICD-P320 digital recorder. Once again, many thanks to all of you who submitted your recordings of the BBC Midwinter Broadcast! We’ll be sharing this post with both the British Antarctic Survey and the BBC World Service. And to all of you, from the SWLing Post: Happy Midwinter! Happy Summer/Winter Solstice! Please note that any map graphics used in this post were originally designed by NuclearVacuum and Ssolbergj–they have been modified for this post under a Creative Commons License CC BY-SA 3.0. This entry was posted in Current Events, International Broadcasting, News, Recordings, Shortwave Radio and tagged Antarctic Midwinter Broadcast, Antarctic Midwinter Broadcast Recordings, Antarctica, BAS, BBC World Service, BBC WS, British Antarctic Survey Team on June 24, 2015 by Thomas. I think it is wonderful that this tradition continues on shortwave, what is wrong with keeping some old technology to keep the tradition going, it gives pleasure like having and driving a vintage car or motorcycle, it may not be a s good as current more modern items but the old can give so much pleasure and fun, sometimes, modern and more perfect technology becomes a bore!!!! In 2015 this broadcast is not needed anymore. Those posted in Antarctic have so many other means of communications. All this highlights is that shortwave is a legacy form of communications. Oh, I think the broadcast honors a winter celebration and long-held tradition; highlighting the vast distance between home and these isolated parts of the globe. True, they have excellent access to digital content in most of these Antarctic stations. But shortwave radio has so much more style and panache than an Internet stream. That’s probably why they still go out of their way to tune in. What a collection! From ALL continents!